Bullet proof glass or ballistic glass is manufactured to protect you against a range of threat levels. Made up of multiple layers of different types of glass or polycarbonate, it has the ability to flex on impact instead of shatter. Thicknesses can vary from as thin as three-quarter inch (19mm) up to three inches (76mm) depending on type of bullet resistant glass materials and needed protection. Safety is important today and it doesn't matter if you are law enforcement working at a secured facility or an everyday law abiding citizen looking for extra protection for your store. 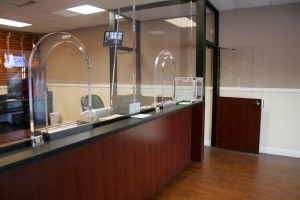 Flower City Glass can supply you with a product that has exceptional attack and ballistic protection as well a visual clarity.